The Serpentis Corporation spared no expense when they contracted the Guardian Angels to create a new line of ultra-exclusive cruisers intended to replace their internal executive fleet of Victorieux Luxury Yachts leased from the Intaki Syndicate. These ships would need to maintain the exquisite luxury and discretion of the yachts while adding devastating combat ability to ensure that Serpentis Corporation VIPs never find themselves outgunned. 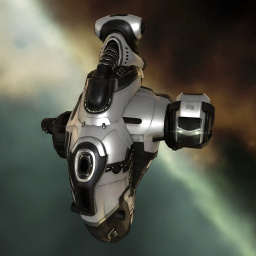 The final ship design delivered by the Cartel engineers included covert ops cloaking capability, powerful hybrid turret hardpoints, and stasis webifier capabilities unmatched by any other ship in the history of New Eden. The first Victor-class Force Recon Ship to complete construction was claimed by Salvador Sarpati himself to serve as his personal cruiser. The Victor was a prize for the top four teams of Alliance Tournament XV. It combines the signature Serpentis web strength and hybrid weapons bonus with an equally impressive web range bonus; a unique and deadly combination. It also has uncharacteristically high powergrid and good CPU, giving it fitting options ships of this type normally wouldn't have. Further information about additional or recommended skills to pilot Victor for a specific or it's common role(s) can be written here. No tagged fittings for Victor. No sub-article about Victor roles or piloting tactics. You can write them here. This page was last modified on 12 May 2018, at 06:50.